The Matrix Sub-Ohm Tank (by High Voltage) is a quality sub-ohm setup with amazing airflow and a large 5ml tank. 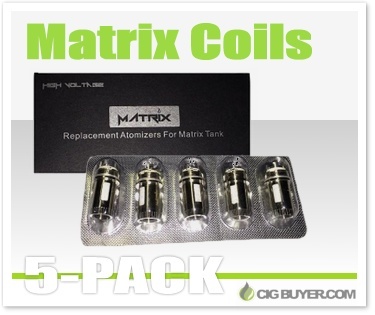 Matrix replacement coils come in 0.2 ohm or 0.6 ohm dual vertical coil configurations and are equipped with a rectangular contact surface which enlarges the coils feeding area; resulting in incredible vapor and flavor. The enhanced dual vertical coils allow you to vape up to 100 watts!